Weekend shoes are often overlooked, but heading out on an adventure demands a stable shoe that can be counted on for walking, dancing, climbing and maybe even running. Yessa is that shoe. 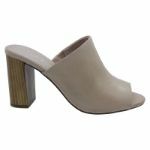 A slip on heeled sandal with a 9cm block heel, the leather lining means she won’t tear in two, and the block heel means no wobbles. Take Yessa home before this weekend comes around!